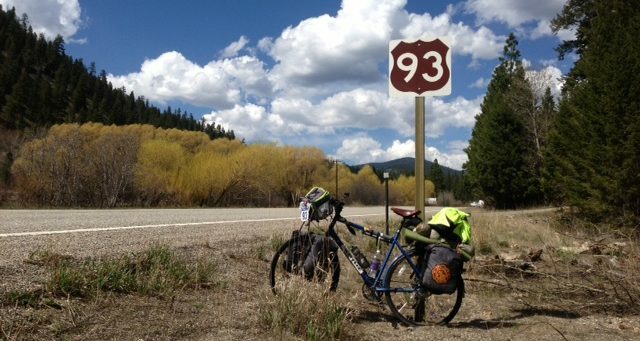 MacKay to Salmon Idaho, long day 120 miles in 12 hours, encountered heavy head winds and rain. I don’t regret the things I’ve done; I regret the things I didn’t do…. The reasons to cycle Highway 16 haven’t changed, but there are more: Still at number one, to raise money, awareness and hope for people affected by Multiple Sclerosis. Number two is still to promote Jasper as a tourism destination when traveling on Highway 93 or Highway 16. And there are a few personal reasons; adventure, challenge, curiosity, surprise, fun, fitness, danger, meditation, fresh air, experience, learning and living, and the chance to see some new countryside, the chance to meet fellow Firefighters, Rotarians and network with all the local folk along the way. During my last adventure, most days everything fell into place, some days not so good, but I met some amazing people and had some interesting and unforgettable experiences. I learnt to take the bad with the good, didn’t set my expectations to high; embracing a ‘go with the flow’ attitude and focused on enjoying the moment. My ‘end to end’ Route 93 trip was successful, sometimes exciting, sometimes heartwarming and sometimes downright stressful and scary. For me a good day on the road was defined by freedom, adventure and the making of many new friendships, always looking forward to the next day.